While most of you south of the border were celebrating Independence Day on July 4th, us Northerners were actually celebrating Canada day on July 1st. The actual meaning behind these 2 days is pretty much the same since Canada Day also celebrates our independence. Back on July 1st, 1867 we united all the British colonies on the great piece of land into one great country, Canada! In celebration of this day I thought it was fitting to dig something special out of my humidor and out of the fridge. 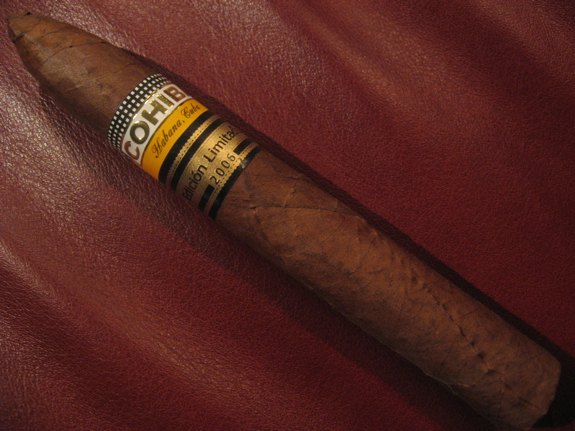 The cigar of choice ended up being a fairly rare Cohiba. 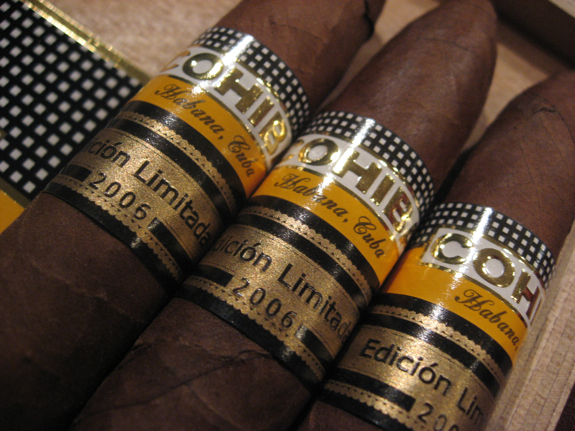 It is the Cohiba Edicion Limitada 2006. It’s a very nice looking Piramide shaped cigar. 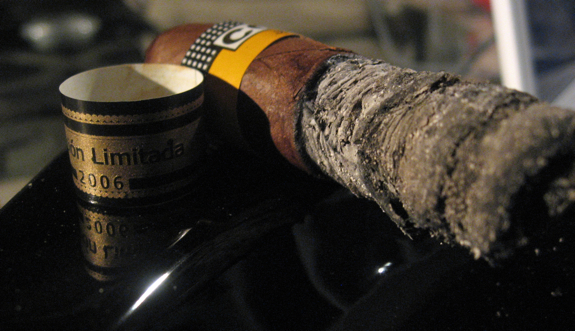 Apart from it’s normal Cohiba band, it’s also adorned with the standard Cuban limited release band. This second band is gold with raised black lettering and border which says “Edicion Limitada 2006”. These limited edition Cuban cigars are usually fairly easy to track down when they are initially released but after a few years they become a well sought after cigar to add to any humidor. I was recently lucky enough to track down a few through a friend and I grabbed them to save for special occasions like this. 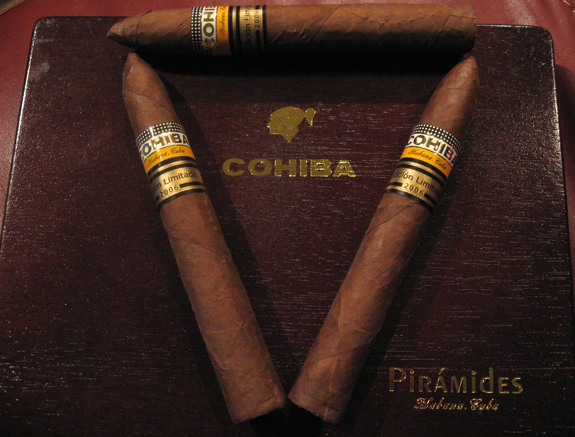 This Piramide vitola was also the vitola for Cohiba’s 2001 Edicion Limitada. It was met with such great fanfare and reviews that they decided to re-release a similar blend. 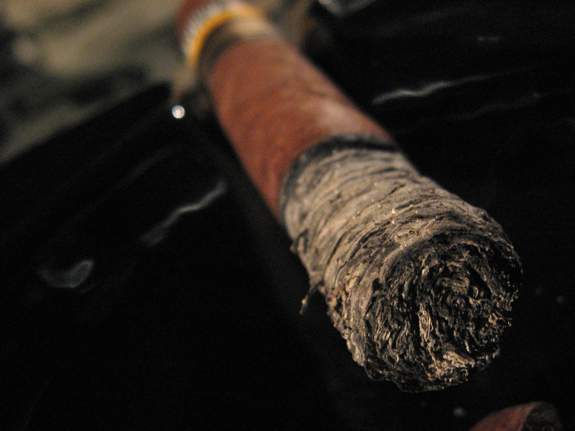 Each of the leaves within the cigar were aged a minimum of 2 years before being rolled into these rare cigars. 2006 also marked the 5th year that Habanos S.A. began offering limited edition cigars on a regular basis. Price: Originally a little over $30. No idea on current value but it’s much higher! •	Burn line stayed nice and straight through the first couple of inches, glad to see that! •	Initial draws have an interesting combination of cedar, chocolate and espresso, great start! •	Now I’m getting something interesting, it’s a good mix of spice and chocolate, almost like a chili spice. If you’ve ever had those gourmet chocolates made with chili you’ll get an idea of how this tastes, very unique! 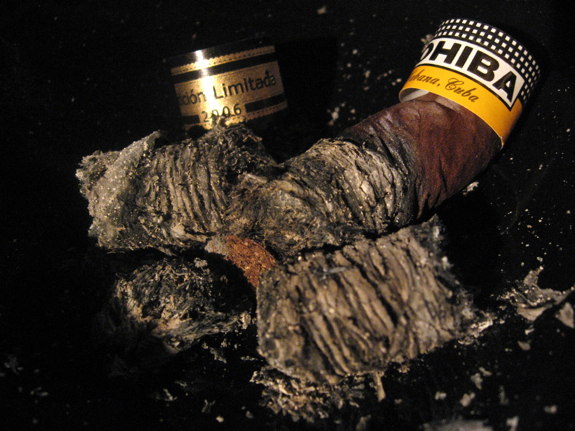 The flavors on the Cohiba Edicion Limitada 2006 were extremely enjoyable right from the start to the finish. They offered some unique touches and kept me on my toes the whole time. 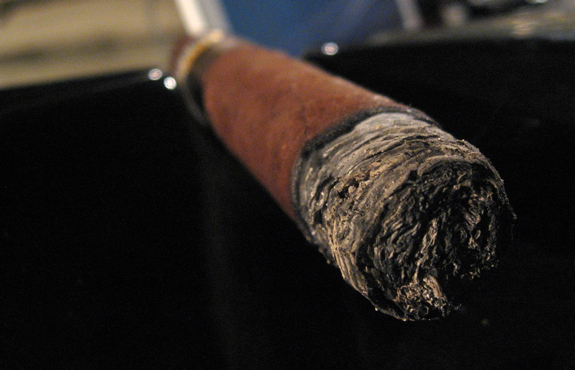 There’s no doubt that they did a quality blending job on this cigar. I was obviously disappointed with the number of touch ups it needed but oddly enough it didn’t affect the flavors much at all. I keep all my limited edition and expensive cigars in a smaller humidor that has a perfect 65-67% humidity almost all the time. The smaller area gives me more control over it, but doesn’t seem like that made a difference. As with most limited editions it usually comes down to a matter of cost and if these are worth their dollar value. At the original price of $30 these were a hard pill to swallow and their value has only gone up since then. The closest cigar I can compare this to is Cohiba’s own Maduro 5 line which was very close in flavor profile, possible just with a bit more spice in the Edicion Limitada 2006. But for the cost, I’d rather pay for and enjoy 3 or 4 Maduro 5’s. 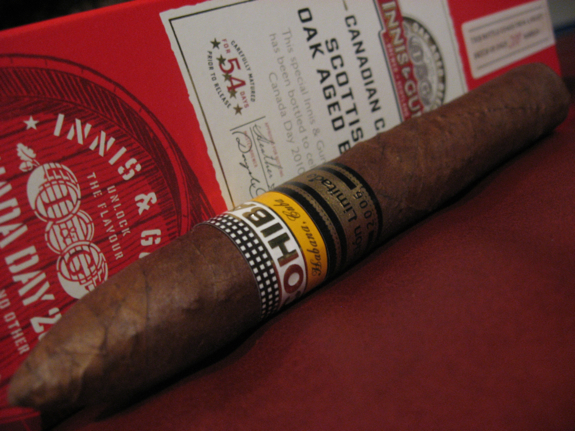 See my review of the Cohiba Maduro 5 Magicos here. Of course, that doesn’t mean I didn’t thoroughly enjoy this rare piece of cigar history! The chocolate and chili combo was especially unique and enjoyable! 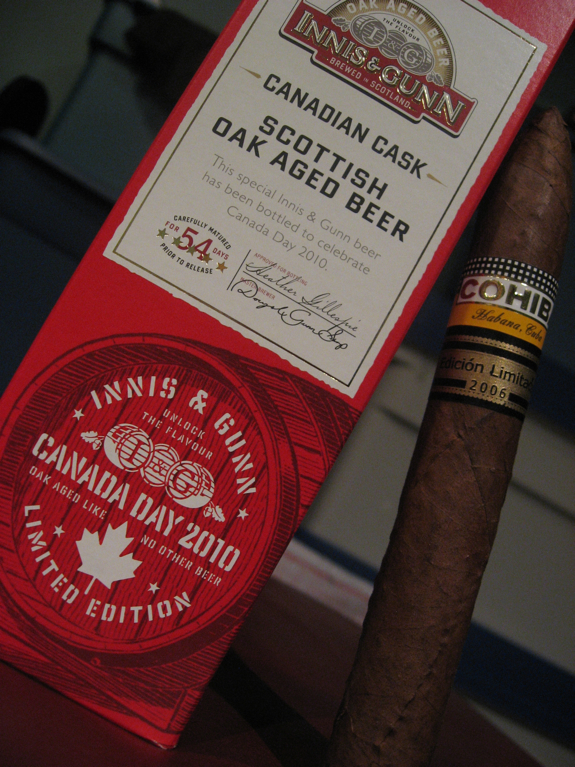 With my special cigar tonight I picked out a special brew and one that fit the Canada Day theme as well. It comes from one of my favorite breweries, Innis & Gunn. The beer is called “Canadian Cask 2010”. This brew was made specifically for Canada Day last year. I bought a few of them last year and had one left that I was saving for this year. 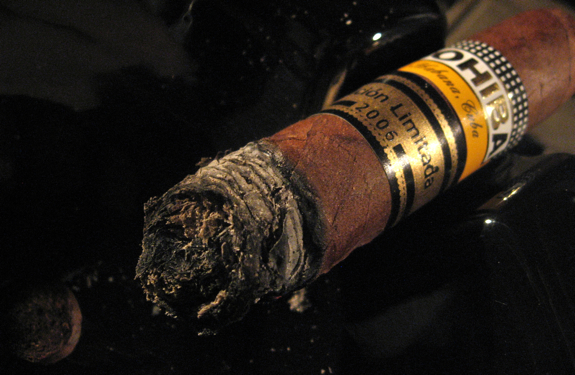 I also reviewed it awhile back with the Camacho Liberty 2009. There’s not much I can say about this beer other than it is fantastic. Basically take their already fantastic Oak Aged Beer and add in some light whiskey barrel and rye flavors and you have an even better brew! Each batch is also aged a longer amount of time in the whiskey barrels, 54 days to be exact. The cigar was not over the top strong so it actually paired well with this full flavored beer. 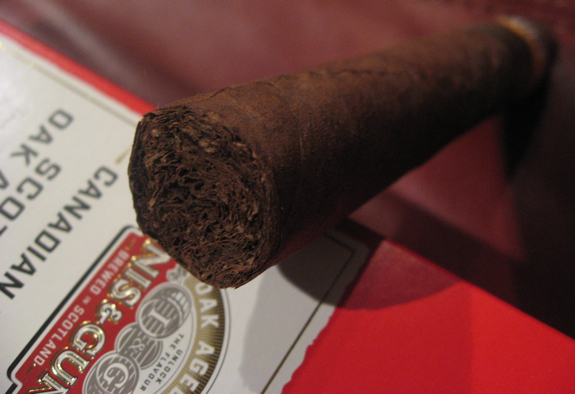 I’d also recommend a fine smooth scotch, cognac or port with this cigar. A nice coffee would also pair well here as a non-alcoholic alternative. Great, now you have me craving a cigar at work..
Nice review Daniel! I’m definitely going to pick up some of that beer! Damn you Canadians…. And your Canadian ways… Man that thing sounds awesome! I guess there has got to be a few perks to living in the Great White North. Chili? Now I am definitely jonesing for a special smoke…. Great review D! I have a box if you want a few! @Dan – This one was from last year, not sure if they released another one for this year but if they did grab a few and let them rest, they get better! Never had 2006 EL. Sounds like a winner. Thanks for sharing. No fair, Daniel! We upstanding Americans would never circumvent the Cuban embargo. lol And your pairing looks great. Unfortunately, even here in the Northwest with our close proximity to our northern friends, what we mostly get are dross like Labatt’s Blah and Molson Ail (payback for sending you Bud and Coors Light, I guess). Hej Daniel, I am from Poland and I know a little English.